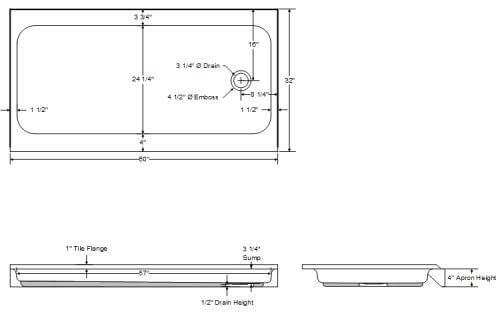 Are you looking for an appropriate retro or midcentury shower base — but (1) don’t have a big bathroom, (2) need to fit a shower base into the spot where an original tub was, and/or (3) are budget-conscious? 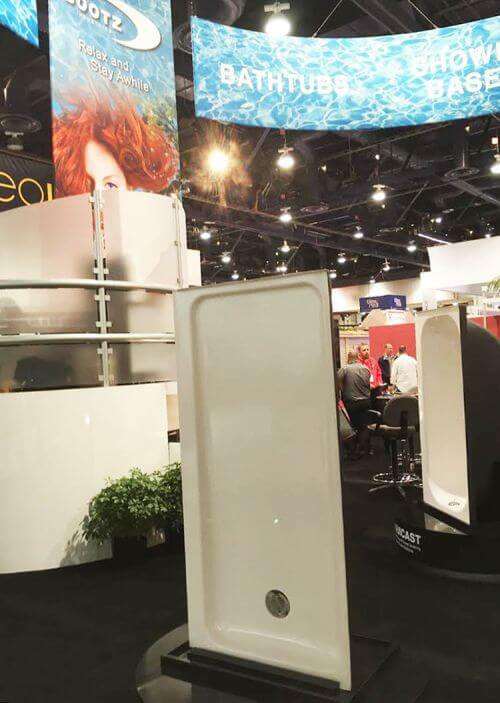 At KBIS 2016 we spotted a new, porcelain-finish-on-steel shower base aka shower pan from Bootz. It’s just 30″ wide, and just $159 at Home Depot. 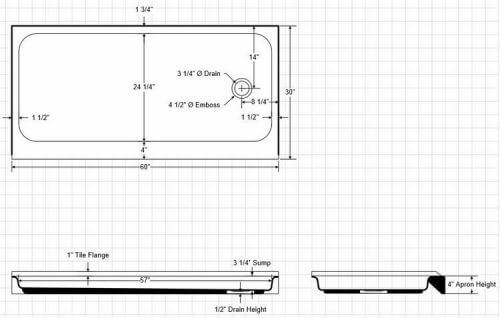 Continuing our research, we discovered they also have a slightly bigger version that’s 32″ wide — a little more elbow room if you have the space for it — and it is listed as $215 at Home Depot. Both widths look like they have similar features. See all the specs for this design on the Bootz website. All Bootz plumbing fixtures are proudly “Made in the USA” and comply with the following standards: ASME A112.19.1/CSA B45.2 Enamelled Steel Plumbing Fixtures, ASTM E162 Surface Flammability, ASTM E662 Smoke Density, ASTM F462 slip-resistant bottom for safety, and the Buy American Act. 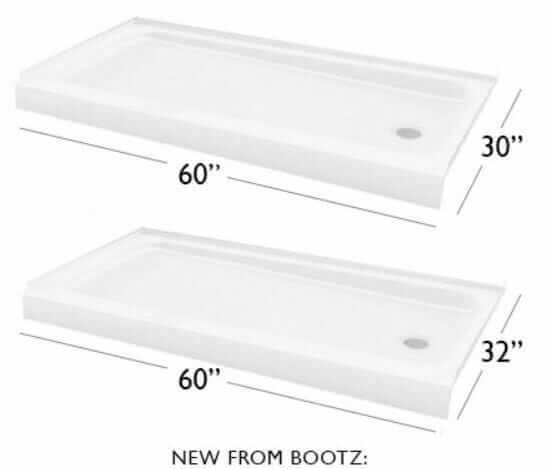 Since 1937, Bootz Industries has strived to become the industry leader in the manufacture and delivery of “porcelain-on-steel” bathtubs, lavatories, and kitchen sinks. Careful attention to detail includes: on- time delivery, product quality, handling and carton design. Contact your nearest plumbing wholesaler or Home Depot Store. The ShowerCast Plus model is two inches wider. 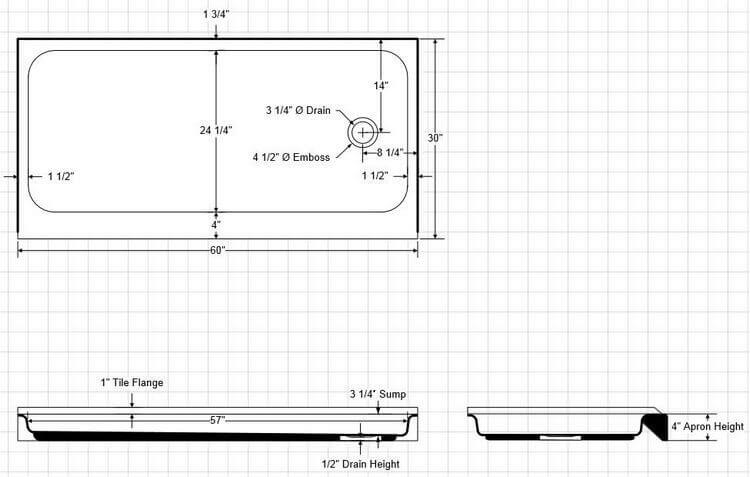 See specs on this design on the Bootz page. The good news about these two shower bases is: These are compact. They can fit into existing tub alcoves or in bathrooms where space is at a premium. The bad news is: These are compact. 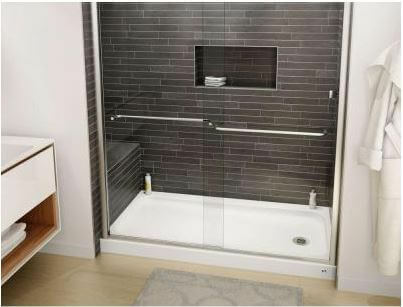 Elbow room is limited by overall dimensions once a shower door is installed. You’d have more elbow room if you put in a shower curtain rather than a glass door, but then you risk splashies outside the shower. 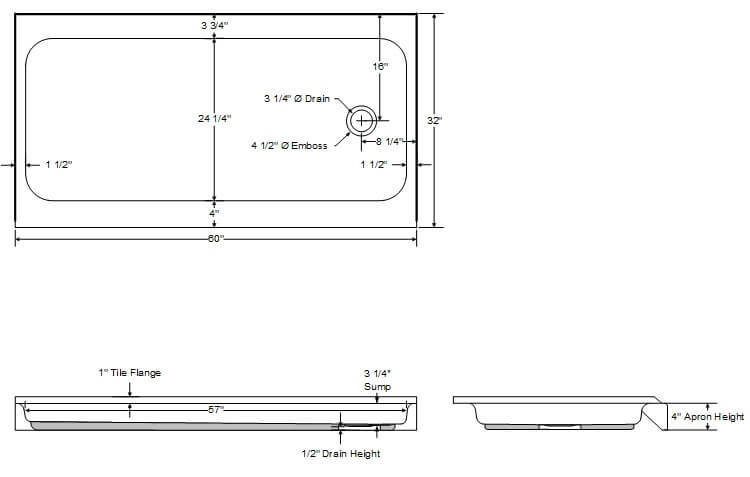 If you want more width, have the space, and can afford it, see our stories on Kohler cast iron shower bases. 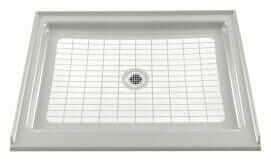 You could also go with something like a preformed terrazzo shower pan (not sure if this can still be obtained and at what sizes) or with a wider base made with a material like Swanstone or fiberglass. That said, I think I really prefer the idea of the porcelain enamel steel or cast iron bases, or the terrazzo — for historical authenticity. Of course, this latter stuff can chip if you drop something sharp on it. A solid surface material may be able to be sanded down. Decisions. Decisions. Hey, remember my video that went viral when I first published it? I talk about my Swanstone base and why I wish I’d gotten an even wider one. How to install a Bootz tub or shower base — fun video! Okay, so now a funny story, in case there is anyone left reading this far. Kate and I walked the floor at KBIS and that’s when we discovered this shower base. I was quite excited to see this product, and we went up and talked to the team that was running the display. We introduced ourselves, and explained how Kate had just installed a Bootz sink with a hudee ring. The Bootz team perked up right away — they said that they had heard me on the microphone (the Wilsonart display was right next door) talking about hudee rings when I gave a media presentation about our new laminate collection with Wilsonart. [I say ‘howdy, hudee’ a lot.] Well, you can imagine how pleased we were to talk hudee rings with the pros at KBIS. We feel so… retro geeky insider! Howdy, hudee!